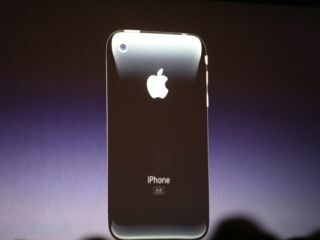 When Steve Jobs took to the stage at the Apple World Wide Developers Conference today, everyone expected him to pull the new iPhone 3G from his pocket, and he didn’t disappoint. In London last year, Jobs announced the 3G iPhone would be hitting this year, with the reason for its delay down to the power issues necessary to connect to high speed 3G networks. The 3G speeds on the device are approaching something akin to those found with WiFi, and the iPhone 3G is 36 per cent faster than other devices, according to Jobs. The new model is thinner than the first generation device, which is a surprise as the improvements to battery life were expected to chunk out this iteration, and features an all-plastic back. The device will have dramatically improved audio, but no word how this will be achieved yet. The 3G iPhone will apparently sport 10 hours talk time on 2G talk, and 5 hours of 3G talk time and 300 hours standby, so the new battery will have to perform well to live up to these specifications. Video will be available for seven hours off one charge, and audio will run for 24 hours. Not bad from Apple! The decision to keep the memory flavours the same as the last model (eight and 16GB) makes sense, as not many users will feel the need to have their whole music collection on a phone, and unless the new iPod Touch turns up with enhanced flash memory, any increase to the iPhone would cannibalise that section of Apple’s market. The expected GPS is there, which isn’t really a surprise thanks to the FCC ruling that 95 per cent of US mobile phones must have the ability to be tracked to within 150 metres. Adding the GPS functionality is crucial for the iPhone’s improved tie-in with Google’s package; especially Maps, where the use of GPS is increasing the app’s functionality constantly. The other changes are less substantial but still absolutely necessary to help users get over the traditional iPhone gripes of yore. The headphone jack is flush rather than embedded, which will help some users or non-proprietary cans. Once again, Apple has missed the boat with haptic feedback - it seems every other mobile manufacturer has realised a touch interface with haptic feedback is so much nicer and easy to switch to having used physical keys for so long. But not Apple. They know there are enough people out there who love to touch and swipe all over the place without the need for the helpful buzz (and it does conserve the all important battery life). Worryingly, MMS was not mentioned in the keynote speech, so we might have to wait to see what the reaction to this is, though MobileMe integration might go some way to explaining it, as Apple is getting heavily involved with mobile email. The camera is still likely to be stuck at 2MP even though the chip had the opportunity for more, and no word on whether the GPS is advanced or not to help save on battery drain. But still, it's the iPhone you've been waiting for, and it could be yours for less than £100.